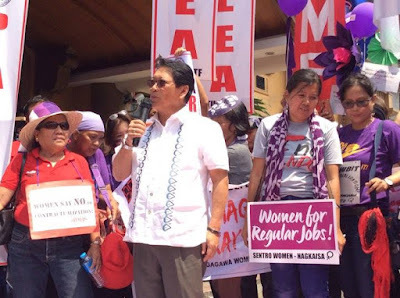 Women members of Partido Manggagawa (PM) and PALEA are back to the Department of Labor and Employment (DOLE) today as the new rules on contractualization is expected to be released by Labor Secretary Silvestre Bello III. A Women March to End Endo was also held yesterday at DOLE led by the Nagkaisa Women Committee. “The new Department Order (DO) must be in line with the workers’ demand for prohibition and the President’s order to stop agency hiring. A DO outside this track is betrayal to the working class,” stated PM Secretary General Judy Ann Miranda. Miranda said women workers have analytically tracked the statements of Secretary Bello and they have observed that the labor official is taking the DTI compromise stand which he keeps parroting since his day one in office. The DTI-DOLE compromise formula intends to regularize contractual workers to the manning agencies and not to the principal employers who hire their services. “A bad DO will make the eve the International Day of Working Women as a day of betrayal as majority of women workers carry the burden of contractualization in the biggest sectors of our economy. We will certainly go after the heads of labor officials who betray the interest of women workers,” said Miranda. More than half of workers in the services sector where contractualization practices are rampant are women. More women will be in the streets tomorrow to celebrate the International Day of Women. PM members will hold a program at Plaza Moriones in the morning before joining the World March of Women at Plaza Miranda. Rallies and noise barrage will also be held at EPZA in Cavite and also in Cebu, Bacolod and Davao on issues of contractualization, death penalty, the lowering of minimum age of criminal liability, and the unabated killings in the country.